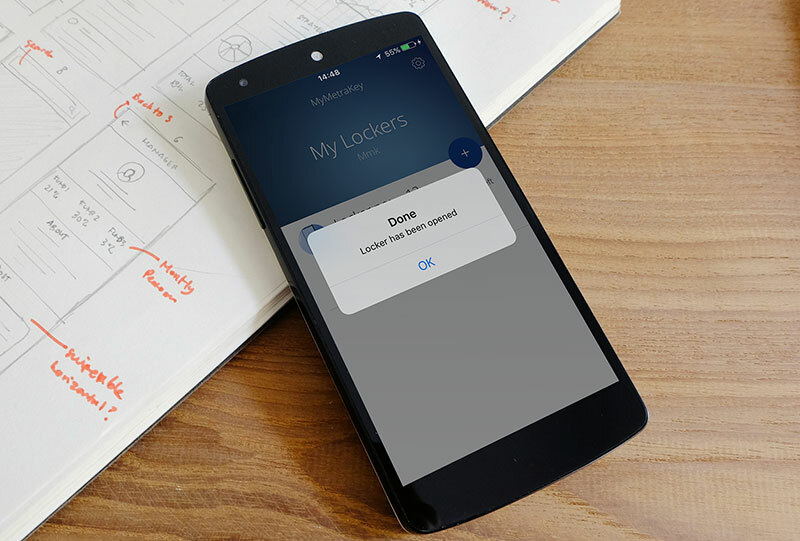 Unlock and manage each workplace locker with the MyMetraKey mobile app. When RFID smartcards came on the scene, people began saying “Forget keys”. With the MyMetraKey app, we can now say “Forget RFID smartcards”…literally. You can leave your smartcard at home, and still open (remotely if needed) your locker with the MyMetraKey app. The MyMetraKey locking solution is one of Metra’s individual locking solutions for workplace lockers. It means that each locker is unlocked/locked individually, without using a central user interface. As with other Metra individual locking options, it’s particularly suitable for organisations where a smaller number of lockers are located in multiple offices/rooms. It’s also very user-friendly for employees, as they don’t need to walk to a central user interface or swipe an RFID card in front of their lockers every time they need to open them. Combining the MyMetraKey locking solution with a locking/unlocking mode, which doesn’t need a locker handle to open or close a locker door, high-end workplace lockers or office locker furniture can now truly have a clean line design. No visible locks, no visible interfaces, no handles. Clean locker doors – just what interior designers have always wished for when creating modern, high-end and user-friendly office environments. The MyMetraKey mobile app solution can be easily integrated into any existing Metra electronic locking system, giving an additional level of user-friendliness to every locker user. The MyMetraKey app is available for Android and iOS.